Grouping the three female pioneers as inventors might feel a bit odd. 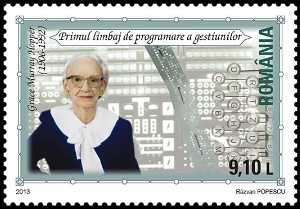 Stefania Maracineau was a scientist and Grace Murray Hopper was a mathematician and computer scientist. Nonetheless, the set is a very welcome addition to the philatelic recognition of the historical contribution of women to science, engineering and mathematics. Stefania Maracineanu (1882-1944) was a Romanian physicist known for her early research in radiation. Born in Bucharest, she was educated in physics and chemistry and became a teacher at the Central School for Girls. 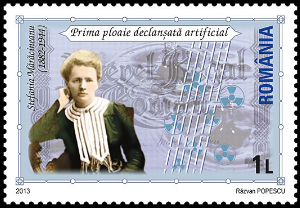 In 1922, with funding from the Romanian minister of Science, she went to the Radium Institute in Paris, France to pursue graduate studies with Marie Curie. It was at the Radium Institute that she did her most notable work. She studied the half-life of polonium and developed a method for measuring the intensity of alpha rays. She was awarded a doctorate in 1924. 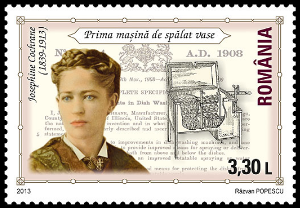 Josephine Cochrane (1839-1913) was an American entrepreneur and inventor of the first commercially successful dishwasher. Cochrane was a widowed socialite and struggling financially when she began working in earnest to develop her ideas around a mechanical dishwasher into a business venture. Much of the early work was done in a shed in her backyard. In 1886 she patented her design which featured a series of wire racks built into a metal wheel to hold dishes. The wheel would turn and the machine would spray soapy water on the dishes. She established Cochran's Crescent Washing Machine Company, and started advertising in local newspapers attracting the attention of restaurants and hotels. In 1893, the Cochrane Dishwasher won an award at the Chicago World's Fair for its design and durability. Grace Murray Hopper (1906-1992) was an American mathematician best known for her contributions to the development of computer programming languages. In 1943, at the height of World War II, Hopper left her job as a university professor to join the United States Navy. She was immediately put to work on the Harvard Mark I, one of the world's first computers. Nobody had ever programmed a computer before. In fact, terms like computer programmer and software didn't yet exist. Hopper and her colleagues dug in and invented the technology of computer programming and the Mark I operated 24-hours a day, 7-days a week until the war ended. After the war, Hopper became a major force in the development of computer languages, inventing the first compiler and working as a leader on the team that developed COBOL, the first standardized programming language. On November 22, 2016, United States President Barack Obama posthumously awarded Hopper the Presidential Medal of Freedom, the nation's highest honor, for her contributions. Grace Hopper - Matriarch of Programming. The Salamis Tablet, Perspectives in Computer History. Ogilvie, Marilyn Bailey and Harvey, Joy Dorothy (2000). The Biographical Dictionary of Women in Science: L-Z. Taylor & Francis. ISBN 0415920388, 9780415920384. Rayner-Canham, Marelene F. and Rayner-Canham, Geoffrey Rayner-Canham (1997). A Devotion to Their Science: Pioneer Women of Radioactivity. Chemical Heritage Foundation. ISBN 0941901157, 9780941901154. Stoyles, Pennie and Pentland, Peter (2006). A to Z of Inventions and Inventors. Black Rabbit Books. ISBN 1583408053, 9781583408056. Music themed topical stamp collectors will enjoy the Belgium 2009 Masters of Music sheetlet. Tastefully rendered by Belgian artist January Maesschalk, the series honors five notable composers: Henry Purcell, GF Handel, Joseph Haydn, Felix Mendelssohn-Bartholdy, and Clara Schumann.